There is zero notification or upfront stated policy ANYWHERE that all charges must go “on your room” key and paid at the end. You cannot pay for anything cash except at the mini mart. If you exceed the hold amount on your credit card you must “ask for more credit” before you can buy anything. This place is a joke and I will never stay here again, very disappointing. Some of the staff were also very rude. The amenities were nice, especially the pool. The food was only OK, and I was very upset about how loud the A/C was in my room. It woke me up in the middle of the night. I liked the location of the property. All the stuff was easily accessible. The property didnt have enough food choices. Huge hotel with lots of amenities. When I booked the hotel i requested a queen size bed that I didn't get. I requested also a suite with ocean view. I got the suite with a view but the ocean was too far I only could see a bit of it. Other than that, buffet was excellent! lot of options and everything was fresh. They have a little super market but prices are extremely high. Think ahead and buy your stuff at Cancun town where prices are really low. Loved my stay there!! We chose the property, because we knew the facility will be extremely comfortable for a family of four adults. Great place to vacations. The services were always good. Everything was clean. Our rooms were taken care of every day. The staff was friendly and helpful. Definitely worth the money we spent during the week. One of the best places my group has vacationed at. The beach area was spotless. We will definitely go back. Very clean. Great rooms. Hard working staff. We will be coming back next year. We have stayed here numerous times, great place to vacation and "chill out". The facility is now quite old and desperately needs updating in the bathrooms, floors and furnishings. We were told we had a beachfront room, but it was on the 7th floor, only facing the beach, not one the beach. No valet parking. Restaurant is Italian. No lunch buffet. Not all-inclusive, therefore very economical. Not catering to "spring breakers", therefore very peaceful. Didn't have "techno beat" blasting, therefore again very peaceful. Staff friendly, premises clean, good food, good price. I've been coming to Cancun for 21 years and would stay here again. Located in Zona Hotelera within a 5-minute walk of Maya Cancun Museum, The Royal Caribbean - An All Suites Resort is within a mile (2 km) of other popular attractions like Aquaworld. 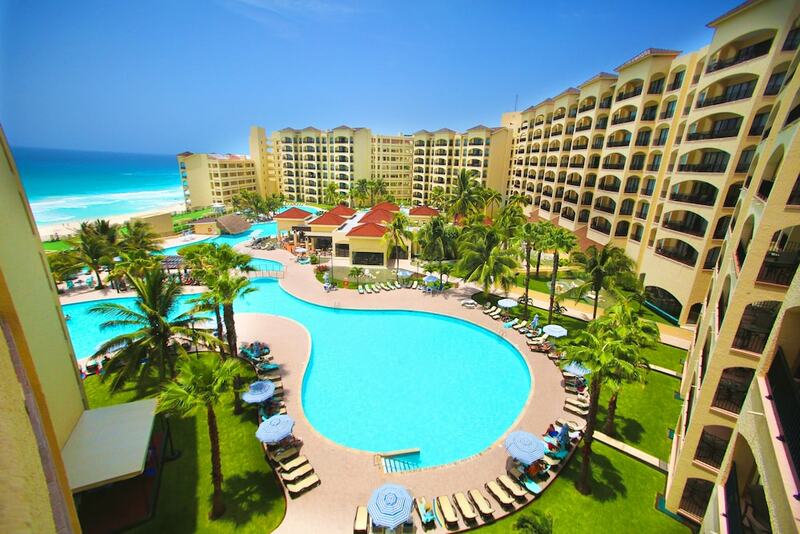 This 207-room, 3.5-star resort welcomes guests with 2 outdoor pools, a restaurant, and free self parking. Enjoy a leisurely bite to eat at the onsite restaurant, or have a drink at the bar/lounge. Start each morning with buffet breakfast, available for a fee from 8 AM to noon. The Royal Caribbean - An All Suites Resort's 207 rooms provide phones. Guests staying at The Royal Caribbean - An All Suites Resort enjoy access to 2 outdoor pools, a fitness center, and free WiFi in public areas. If you drive, take advantage of free parking. The 24-hour front desk has multilingual staff ready to assist with dry cleaning/laundry and tours/tickets. Other amenities at this beach resort include a kids' club, coffee/tea in a common area, and a free grocery shopping service. Buffet breakfast is served daily from 8 AM to noon for a fee. 2 outdoor swimming pools are on site, and the resort also has a fitness center. The preferred airport is Cancun, Quintana Roo (CUN-Cancun Intl. ): 16-min drive, 10 mi/16.1 km.